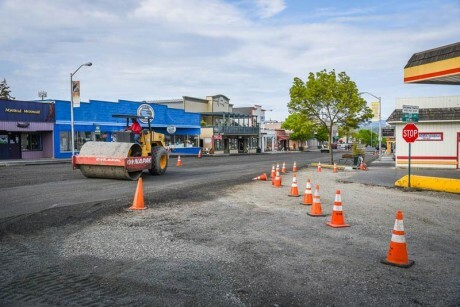 The Spring Street Utility Replacement Project has reached its final phase. The majority of sidewalk repairs are complete, utilities are connected from the new main to individual properties, and the Contractor is prepping for pavement. Street Closure is scheduled from 6 a.m. to 5 p.m. on Thursday & Friday, April 28th-29th. Work delays may require an extension of closure and construction hours until no later than 7 p.m. The street will be reopened each evening and no construction will occur over the weekend. Paving is anticipated to begin on Thursday, April 28th. Spring Street will occur first followed by Argyle Avenue. Currently, Argyle Avenue is scheduled to be paved on Monday, May 2nd. Parking may be utilized when the street is reopened both evenings. All vehicles must be moved from the area tomorrow and Friday by 6 a.m. Unmoved vehicles must be towed at the owner’s expense to accommodate paving. Signage will remain in place indicating closure. Sidewalks will continue to be open to pedestrians. Every effort is being made to limit closures and delays. Drivers are asked to plan alternate routes due to limited access. Questions regarding the project may be directed to Town Hall or the on-site Project Manager. As always, The Town appreciates the continued patience of business owners, residents and visitors.